Residents of Bradley Stoke are hoping to win their town faster internet after BT offered to equip five areas across the UK with fibre-optic broadband. The firm's Race to Infinity sees communities voting to get their exchange wired up. In Bradley Stoke, the push has been backed by the town council and a local independent news website. The town currently suffers from being half way between two exchanges meaning many suffer from poor speeds. Parts of the town are some four miles from the Almondsbury and Filton exchanges. With distance being a big factor in the speeds received by users it means many in Bradley Stoke see speeds as slow as 512kbps. According to the government the average speed in the UK is some 10 times faster at 5Mbps. A government report said people should receive 2Mbps. But winning the vote to get super-fast broadband would see residents get connected at speeds of up to 40Mbps. Stephen Horton, the editor of the Bradley Stoke Journal, said people wanted faster speeds to take part in online gaming, to watch on-demand films via services such as the iPlayer and for several family members to use the internet at the same time. Mr Horton said that both BT and Virgin Media had overlooked Bradley Stoke several times already. 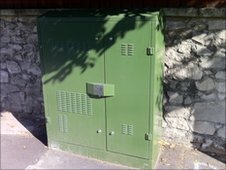 Fibre-optic broadband, which connects to cabinets at the end of roads rather than further away exchanges, is now live in several parts of Bristol and in Downend. And although Virgin does cover some of the older parts of Bradley Stoke, the newer areas were not cabled up, leaving residents with no option other than to connect via BT. He is now calling for the telecoms giant to be more open and transparent in how exchanges are picked for super-fast broadband. "I would have thought that a densely populated area like ours should represent a sound economic case. "The way things are going, we're going to end up in the notorious 'final third' of the country that the providers say are not commercially viable. "That would leave us begging for government funding at a time of major spending cuts." The impact of slow connection speeds is not just restricted to leisure uses. One man, who runs a graphic design firm in the town, told BBC Bristol that the 1Mbps connection he gets was "very bad". Rob Wilson, who runs fortyfour creative, said it would be "huge" for his business if he could get a faster connection. "If a customer comes to me wanting a Flash [graphics intensive] website - to put it together is fine, but to test it I would have to go to my parents in nearby Stoke Lodge. "When you are into graphic design and websites - and you live in Bradley Stoke and can't get on, or if you do you're there for hours waiting for connections, it gets tricky." He added that the current broadband speed offering is often beaten by people who live in rural locations, which was "pathetic". BT spokesman Chris Orum said Bradley Stoke had not been overlooked but the exchanges were built before the town. He said the Infinity product would be rolled out to two thirds of the UK by 2015. "There will be more to follow, it's just when we do that. It's all about gauging demand so we're looking to roll out where demand is highest."